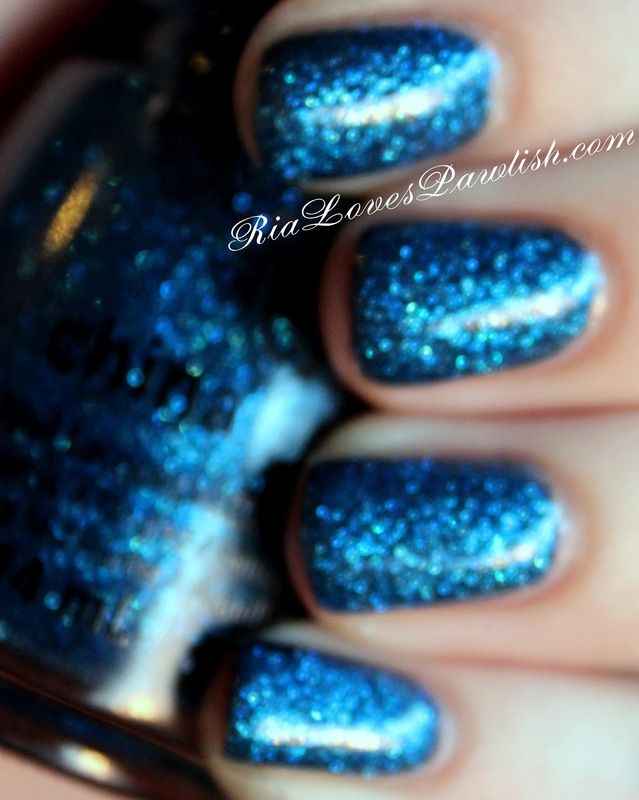 today from the China Glaze Twinkle collection we have... Feeling Twinkly! (it's a press sample, kindly provided to me for review). i love that the name of this polish matches up with the name of the collection. it's a fairly dense blue glitter consisting of a couple different sized pieces... i can't quite tell if it's in a sheer blue base or there is just so much micro-glitter it looks blue! i feel like it would take quite a few coats to get it completely opaque on its own, but it builds up quickly over a base color! i used China Glaze Out Like A Light (also a press sample). over the dark greY, Feeling Twinkly has so much depth and sparkle! you could achieve a totally different, lighter look if layered over something like white. like most glitters, this one really comes to life when finished off with a shiny topcoat! i LOVE this combo! i keep looking down at my nails and smiling... blue remains my favorite color to have on my nails, and these polishes together? perfection! two coats Feeling Twinkly, over China Glaze Out Like A Light, finished off with one coat Salon Perfect Crystal Clear Top Coat. (all three are press samples). here's an out of focus shot to show off just how sparkly it is!